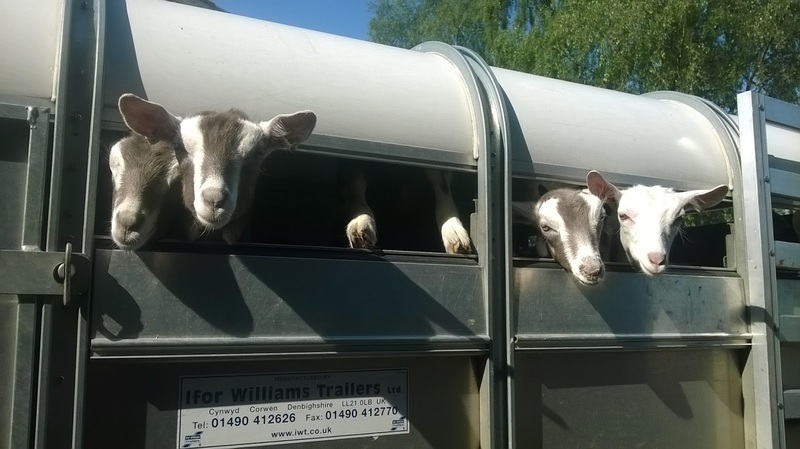 Ellie's Dairy - The Finest Goat Milk, from Kent: Welcome back! 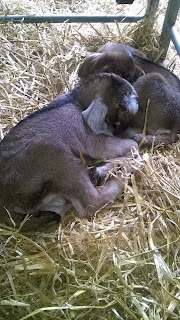 Welcome back to the land of goatie blogging! It's been a while eh? As the dust starts to settle and sleep is no longer just a distant memory, I am hoping that I will find time to write our blog once again. What can I say? It's been a tough kidding season this year for many reasons that I won't bore you with. But in a nutshell - an 'abortion storm' early in the season brought us the sadness of several early losses (for reasons which the vets still cannot advise), a number of our older ladies passing on (more about those in another blog as they all deserve to be remembered), dairy fairy Julie with a knee replacement (still recovering) and young Joe with a very sudden and serious illness (now back, almost fighting fit!) ... Lots of new babies to deal with, all that lovely fresh milk coming back on stream and tons of cheese to be made and packed .. and sold. It's been a slog but hopefully we are coming out the other end! 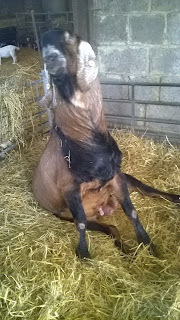 As I write, we have just two girlies left to have their babies and then the season is over for another year. 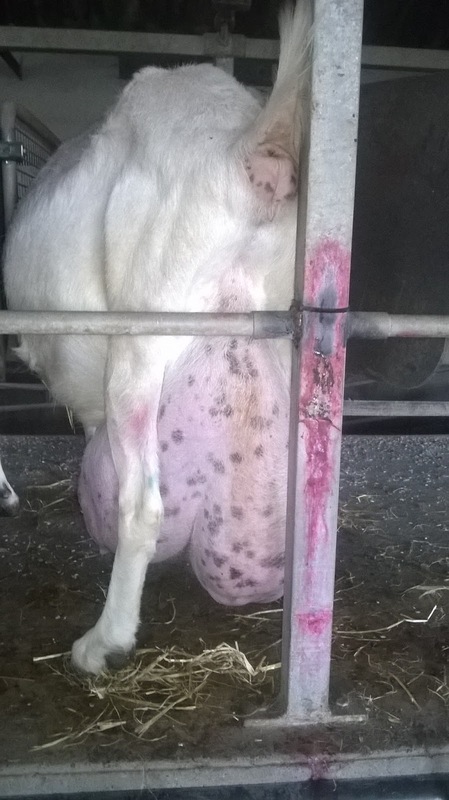 Gilly still has over a week to go but is struggling with the most enormous udder. 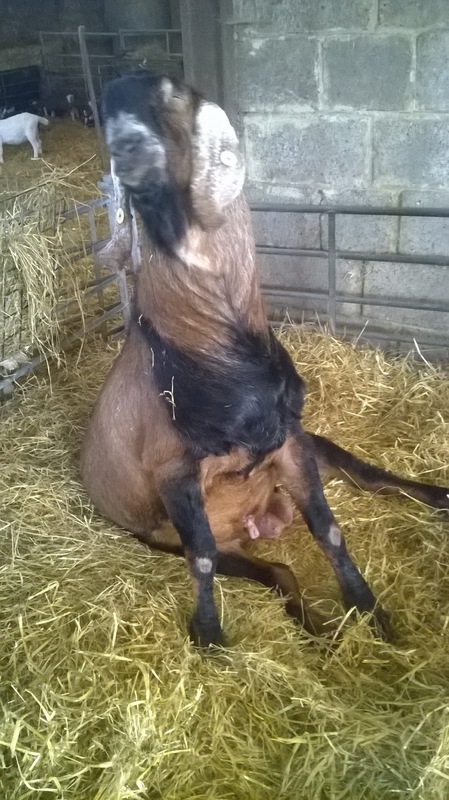 We are wondering if we can construct some kind of goatie bra to take the strain off her back .. Dolly Parton, eat your heart out! 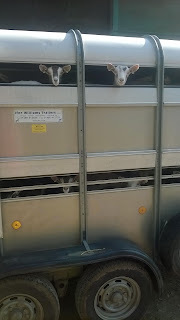 The babies seem to grow so quickly and the first lot went off to their new home in Hereford earlier this week to join many of our other goaties already living with Andrew and Diane. 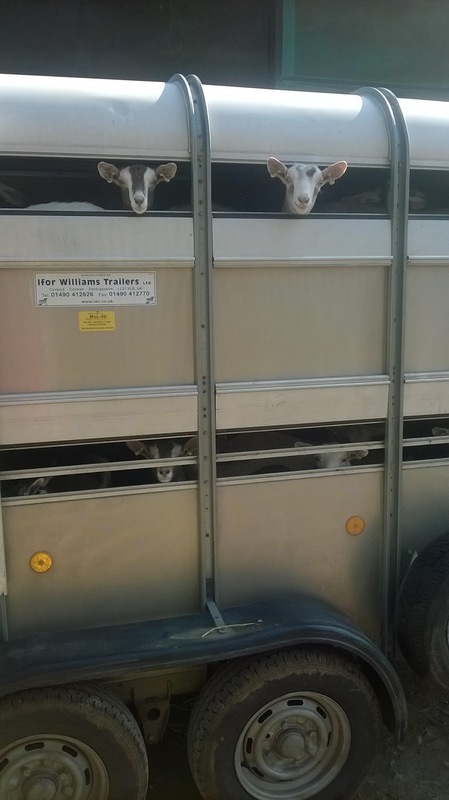 Always sad to see those little faces peering out of the side! David made it there in good time and reported that all the girls came skipping out of the trailer quite happily at the other end. Shares, our gate-jumping goat, had two little chaps a couple of weeks ago. 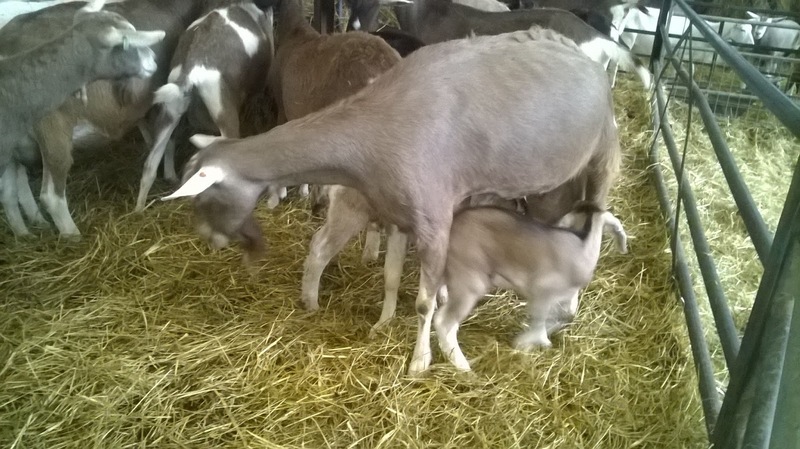 Not usually the maternal type, for some reason she has decided that she does not want to be parted from her babies this year. 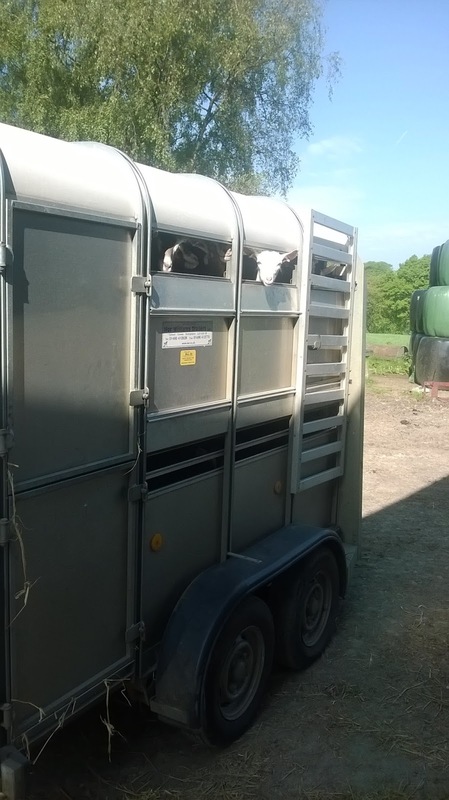 We returned her to the milking herd as usual after a few days with them but she kept on leaping over the gates to go and find them. She refused to stay in .. And so, we moved the little chaps back in with her and the rest of the herd ..
She is a very attentive mum but happily wanders off and leaves them behind from time to time. Several other goats have taken it upon themselves to babysit until she returns. Minnie, Ladybird and Serena check that the babies are safe and follow them round to make sure that they don't get up to any mischief. 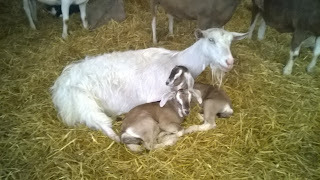 And sometimes, Milly just settles down next to them and everyone has a little nap! Most of our babies this year were sired by young Fenn, but the last few belong to our dear Hugo and so we have a selection of those wonderful ears again .. Here's two of the latest beauties .. The big man himself has just been taking it really easy. He has put on quite a bit of weight recently and has taken to sitting on his bottom like a dog from time to time! And so it's time for me to return to my little caravan outside the goat shed for another night. Cleo looks like she may be thinking about having babies so it could be a long night .. or she may just hold everything in for David to deal with over the weekend while I am out at markets!